Margaritas come in every flavor imaginable and a great variety of fruits pair well with tequila. When it's time for a refreshing and fruity margarita, you'll have no problems finding a tasty recipe. The Margarita is supposed to be a fruity drink. The original recipe simply uses lime with a hint of orange and from there the possibilities are endless. These cocktails are fantastic ways to drink the fruits of the season and fresh fruits are not required for every recipe, either. Many simply use a fruity liqueur for the flavor. From apples and strawberries to tangerines and melons, let's explore some of the tastiest fruit margaritas you can mix up. It all begins with the original Margarita. It is simple, yet timeless and a drink that is best when made from fresh ingredients. Of course, if you feel like firing up the blender, you can always enjoy this Margarita frozen. In either the shaken or frozen version, tart lime is the featured fruit. 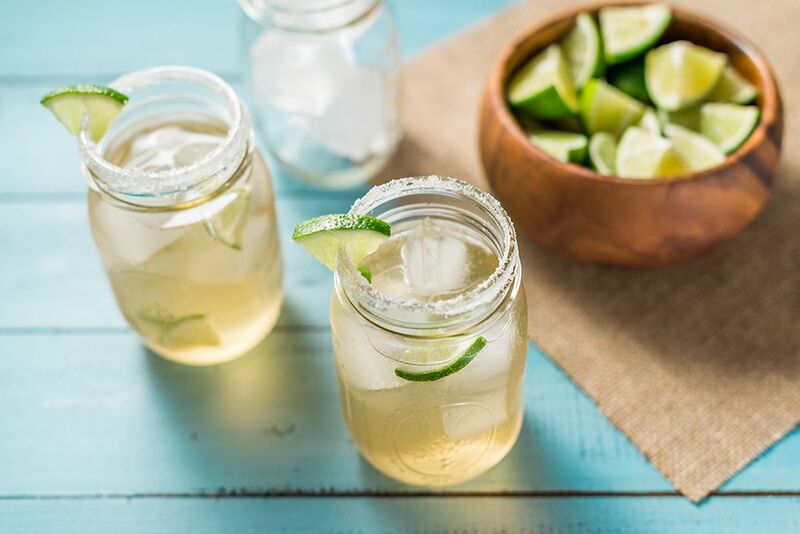 You will need 1-ounce per drink, which is the typical yield from one large lime. It's simple, it's fantastic, and it's far better than those far-too-sweet margarita mixes. One of the favorite blended margaritas of all time. The Strawberry Margarita is an icon in the tequila scene and it's unbelievably easy to mix up. This cocktail is great, but it's even better with fresh strawberries. Sure, frozen berries make a nice drink, yet there's something magical about it when they come straight out of the garden. The best part? Strawberry and blender seasons coincide, leaving you with no excuses to avoid the freshness. The Blue Margarita has long been a favorite. Although it looks completely different than the original Margarita, it tastes almost exactly the same. How is that possible? Quite simply, it's all about the orange liqueur. Curacao and triple sec are both orange flavored, yet by choosing blue curacao the drink takes on a completely different look. It's a fun trick for creating those irresistible blue cocktails. Fresh raspberries in a blender produce one fabulous summer cocktail. It's just as easy as the strawberry version, you're simply switching the fruit. The wonderful thing about the Raspberry Margarita is that the berries freeze so well. Take advantage of berry season, freeze them yourself and enjoy this drink all year long. Not a fan of the blender? This one's super easy to shake up as well. No berries available? If you have a raspberry liqueur like Chambord, there's always the Raspberita. The full flavor of apples with a tart kick. The Apple Margarita is a favorite and you have a number of options for making it. This particular recipe is blended and it finds a balance of the fruit flavor by using both apple schnapps and juice. It remains flavorful without being overly tart and the cinnamon-sugar rim is a fun addition. This is the ultimate summertime sipper. Featuring the best fruit of the season, it's hard to pass up a freshly made Watermelon Margarita. While this recipe features watermelon, you can use it for your favorite melon or choose to combine multiple melons. The possibilities are endless and few drinks are as perfect for a late summer barbecue. A stunning green cocktail with a lovely melon flavor. Again, a simple switch of the liqueur creates a magical cocktail and proves just how versatile the Margarita is. In this case, the orange becomes melon and you'll likely turn to that reliable bottle of Midori. It's a quick and simple spin that can really shake up your cocktail routine. Just as you might expect, this margarita is all about the peach and it is delicious. Once again, it's blended and it doubles up on the signature fruit. By using two ingredients for the same fruit flavor, you really liven up margarita's flavor and it happens quite often. It's a simple trick that gives the drink more depth. In this case, the schnapps adds to the sweetness while the peach fruit brings in the natural flavor. This margarita gets a little peachy. It's another fun blue cocktail and it's delightfully easy to mix up for any occasion. As with most margaritas, you can toss this into the blender or shake it up. Either way, the Catalina Margarita is wonderful and a fantastic excuse to put that bottle of peach schnapps to use. Fresh pomegranate and passion fruit combine for a very special margarita. It's fun, fruity, and a tempting treat. Pomegranate is another winter fruit and its juicy little seeds make any pomegranate juice pale in comparison. This is the ideal cocktail to shake up when you're making fresh grenadine, which makes the process just a little more fun. Sultry mango in a margarita, what more could you ask for? This cocktail recipe could not be any easier and you'll be delighted by the fun twist on the original. Essentially, the Mango Margarita replaces triple sec with a mango liqueur. It's served 'up' but it's really nice on the rocks as well. If you feel like adding a twist, give it a dash of hot sauce. You'll be surprised how well it works. A taste of the islands in a blended fruit medley. The Hawaiian Margarita is the ultimate fruit indulgence and it's ideal for summer parties. You can use frozen strawberries and pineapple but will find that fresh is best in this cocktail. If you take ten minutes to cut the fruit, you will improve your cocktail considerably and find that it was worth a little extra effort. Filled with the flavor of orange, this frozen delight is a gem for summer days. It also has a unique ingredient that makes it an exceptional blended drink. Rarely do we use something like orange sherbet in our cocktails, but it works very well in this recipe. Rather than a citrus-heavy margarita, the ice cream gives the drink a light, semi-sweet, and creamy taste that is a pure delight on hot days. It's not 'bloody' like the Bloody Mary, but 'bloody' as in blood orange. It's the ideal way to enjoy your margarita in the middle of winter when the red-colored citrus is at its peak of freshness. This shaken cocktail requires everything found in the original Margarita, it simply adds an ounce of fresh blood orange juice. You'll love the sweeter citrus taste and it is the ultimate mood boost for the winter blues. Tempting tangerine flavor with a margarita base; it's delicious. Citrus margaritas are anything but boring and this is another fine example. It is recipes like the Tangerine Margarita that can inspire us to look for whatever is freshest in the produce market. If the tangerines look phenomenal and the oranges sub-par, there's no need to downgrade -- just use what's best at the moment.